Explanation: While anxiously waiting for Comet ISON to brighten further as it falls toward the Sun, northern skygazers can also find three other bright comets in the east before dawn. In fact, Comet Lovejoy C/2013 R1 is currently the morning sky's brightest. Only discovered in September and not a sungrazing comet, this Comet Lovejoy is nearing the edge of naked-eye visibility and might be spotted from very dark sky sites. Sporting a greenish coma and tail in this telescopic view taken on November 7, Comet Lovejoy is about 0.5 AU from our fair planet and 1.2 AU from the Sun. 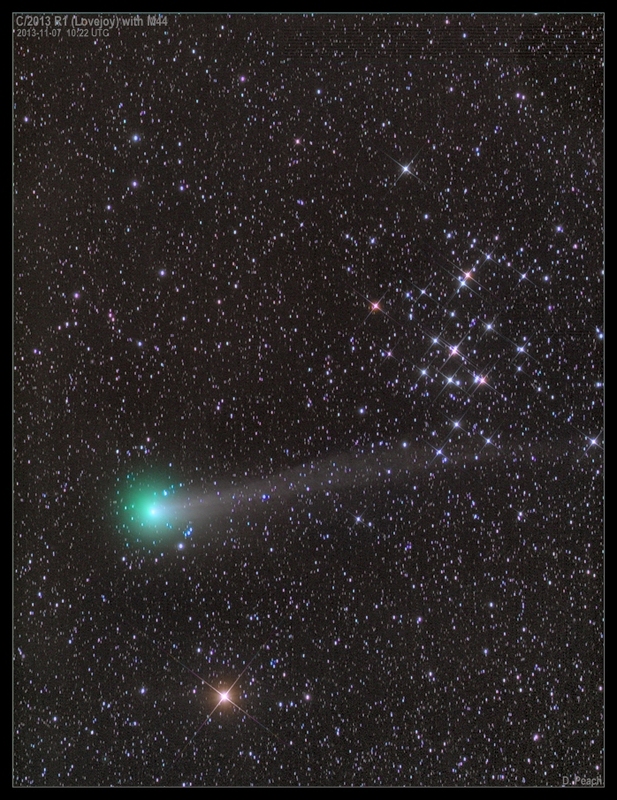 The comet is having a photogenic Messier moment, sweeping past well known star cluster M44, the Beehive in Cancer. Yellowish bright star Delta Cancri is near the bottom of the frame.